The composer is Stan Bann, the arranger is Stan, and the conductor is Stan. 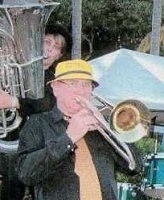 Stan is also an extremely good trombone player. I have been an admirer from afar for years and we once started an Arranging section together on the old Trombone Forum.